Comfortable, cheap and acoustically sound, Skullcandy's Grind Wireless over-ear headphones are as good or better than the competition for around half the price. 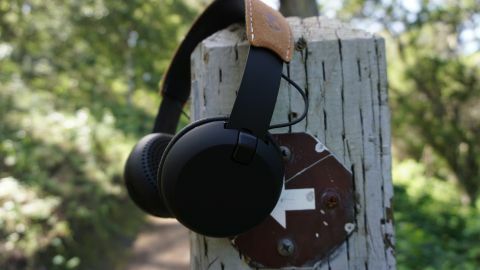 Skullcandy, a brand that was once known for cheap earbuds and lackluster headphones, has been full of surprises these days. First, it put out the excellently priced Skullcandy Grind, a wired headset with exceptional sound quality and comfortable padding. Now, it's followed that with a wireless version that packs in everything we loved about the original. And, more importantly, Skullcandy has done it without tacking on an extra zero to the price tag. The headphones, as you might guess, are called the Skullcandy Grind Wireless and retail for $89 (£69, about AU$116). They're available in six different colors and patterns and sound better than 95% of the wireless headphones in the sub-$100 category. It's hard to talk about the Grind Wireless's design in any definitive way. Because it's available in so many colors and patterns, you can outfit your cans exactly how you please. On one end of the (color) spectrum, is the all-blue design with black accents that's fairly sporty. On the other is the gunmetal and gray design that has a plaid bridge that basically screams hipster audiophile or technophile lumberjack. The review sample sent to techradar is a simplistic, yet sophisticated, mix of black and faux brown leather on the top of the bridge. Beneath the leather covering is soft black foam, stitched into place with a breathable mesh layer. The cushiony foam and soft ear pads work in tandem to form one of the most comfortable-fitting headsets the Park City, Utah-based audio company has ever created. Turning now to the feature set, the Grind Wireless has three minimalist control buttons: volume up, volume down and the main function button that's used to power on and off the headset as well as sync a new device to it. Each volume button, when held down for three seconds, skips to the next or previous track. The main function button is responsible for controlling Bluetooth and answering incoming calls. The Grind Wireless comes with a built-in microphone, as well as an optional 3.5mm audio jack for the times you don't mind being tethered to your device. The word I keep coming back to when testing the Skullcandy Grind Wireless is "surprising". Surprising because, one, the Grind Wireless has a deep, well-rounded sound in a super-light headset and, two, it costs half as much as other comparable wireless headphones. To that end, it seems like no matter what music genre I throw at them, the Grind Wireless impresses me each and every time. Do you have a particularly bass-heavy music library? The Grind Wireless handles lows better than a pair of Beats ever could. The same is true for mids and highs in genres like rock, EDM, acoustic and singer/songwriter. Now, are they as powerful as a proper pair of Sennheisers? No. Can they stand up to a pair of planar magnetic cans, like the Oppo PM-3? No, definitely not. But considering that those aural bad boys cost as much as a game console, the Grind Wireless simply does a better job at giving audio enthusiasts a deep, full experience for a reasonable price. My only qualms with the Grind Wireless are that they come a bit understocked (the only items in the box are the headphones, a 3.5mm audio cable and a micro-USB cable) and the battery. It's advertised to hold a charge for 12 hours, but it doesn't quite live up to that mark. I frequently went to use the Grind Wireless only to find them out of juice after my last listening session. One explanation for this is that the headphones won't ever turn off if they're connected via Bluetooth. Even if you haven't listened to something in six hours, the Grind Wireless will sit there patiently, waiting for a chance to wow you with the next track from your music library. As for the accessories, a carrying case or charging block would have been welcome, instead of leaving it up to you to have these things in your possession. At the end of the day, though, both those two performance faux pas are far outweighed by stellar sound – and an even more stellar price. In the battle of the brands, it can be hard to trust an outsider. You probably know and trust companies like Sennheiser, Sony, Bose and Beats. And nothing against the tried and true headphone manufacturers, but a lot of what you're paying for is the name. The Skullcandy Grind Wireless is a black sheep, it breaks convention left and right and yet delivers in all the major areas. It's far from perfect (see: battery life and accessories), but, for the price tag, you're getting a great-sounding, well-constructed pair of cans that know how to rumble with bass notes and rock with mids and highs.